President Donald Trump has signed two presidential orders to boost “broader, faster – and better internet coverage” in rural areas after addressing the largest general farm organization in the country. 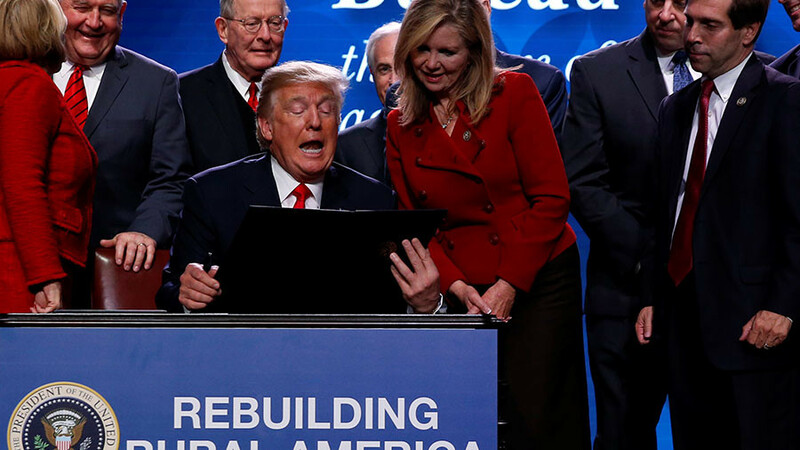 At the American Farm Bureau Federation’s annual conference in Nashville, Tennessee, on Monday, under the theme “Rebuilding Rural America,” Trump told the audience “you are forgotten no more.” The address was similar in tone and style to his campaign speeches. The first presidential order, “Streamlining and expediting requests to locate broadband facilities in rural America,” streamlines broadband installation processes for federal agencies by standardizing forms and contracts for installing antennas on federal buildings, according to the White House. The second, “Supporting broadband tower facilities in rural America and federal properties managed by the Department of the Interior,” notifies the Department of Interior to set aside assets for broadband installation on federal land. Trump said farmers had suffered the “relentless intrusion from the army of regulators” for years, while highlighting his achievements in first year in office. He vowed to renegotiate NAFTA and build a wall on the Southern border. Trump's opening remarks focused on praising the roles farmers have played in US history, saying they founded the country and won its independence. “Our continent was tamed by farmers… Our armies were fed by, and were made of, farmers,” he said. Trump told the crowd that tax cuts were already benefiting family farmers and other middle class Americans, as “Over a million workers have already received a tax cut bonus,” he said. Farmers will be able to deduct the cost of equipment next year and be “spared the punishment of the deeply unfair estate tax, known as the death tax, so you can keep the farm in your family!” he said to a standing ovation. Trump promised to work with Congress to pass a farm bill “that includes crop insurance – unless you don’t want me to!” he said in a jocular tone. While Trump had ample support among rural voters in 2016, he proposed cutting $46.5 billion of federal agricultural funding last May, Reuters reported. The plan had called for caps on government spending toward crop insurance. Attendees rallied in chants of “USA! USA!” when Trump shifted to defending national pride against protesters. Trump also drew loud applause for noting that his administration “ditched” the Obama-era Waters of the United States Rule, a regulation that expanded the definition of waterways where activities were regulated or prohibited. Lauding other regulatory repeals, Trump said, “We’re restoring the rule of law and protecting our cherished Second Amendment,” reinforcing his point with a rifle-shooting gesture. “Farm country is God’s country,” Trump said to another standing ovation.